Thanksgiving is a special time for most Americans, but only one citizen will have a truly out-of-this world holiday experience. NASA astronaut Kevin Ford will celebrate Thanksgiving in space while orbiting about 250 miles (400 kilometers) above Earth's surface. Ford commands the International Space Station's Expedition 34 mission, and he's the only American aboard the orbiting lab at the moment. Astronauts on the space station can enjoy ornbread stuffing, yams, mashed potatoes, and turkey, and more for Thanksgiving. Like most of his countrymen, Ford will get today (Nov. 22) off, as will his two Expedition 34 crewmates, Russian cosmonauts Oleg Novitskiy and Evgeny Tarelkin. The trio will mark the holiday in the time-honored American way. "We'll have a little Thanksgiving feast onboard," Ford said in a video beamed down from the space station Tuesday (Nov. 20). He proceeded to show viewers what's on the menu, brandishing packets of smoked turkey, Russian mashed potatoes with onions, dehydrated cornbread dressing and cherry-peach cobbler, among other items. While Thanksgiving is not a holiday most Russians observe here on the ground, the situation is different in space. Aboard the station, crewmembers tend to celebrate the holidays of their international colleagues. Ford said he, Novitskiy and Tarelkin have a lot to be thankful for this year. "One of the things I would like to say we're really thankful for — of course, outside of our family and friends — is the support we receive from Earth 24 hours a day, seven days a week, all year round, from our international flight control teams," Ford said. "So thank you for that support and being with us." Ford, Novitskiy and Tarelkin arrived at the space station on Oct. 25. 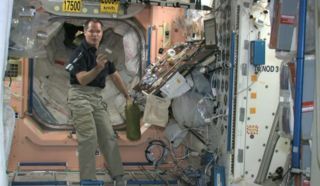 Upon floating through the airlock, they joined Expedition 33, which was commanded by NASA astronaut Sunita Williams and also included Japanese spaceflyer Akihiko Hoshide and Russian cosmonaut Yuri Malenchenko. Williams, Hoshide and Malenchenko returned to Earth on Nov. 19, leaving Ford in command of the new Expedition 34. He, Novitskiy and Tarelkin will be joined by three new crewmembers next month, just in time to celebrate Christmas and to ring in the New Year. Ford and his two Russian crewmates will return to Earth in March 2013.You can wish Ford and his crewmates a Happy Thanksgiving and holiday cheer by sending them a holiday card via NASA here. Follow SPACE.com senior writer Mike Wall on Twitter @michaeldwall or SPACE.com @Spacedotcom. We're also onFacebook and Google+.